Most orders are dispatched in 3-5 business days. 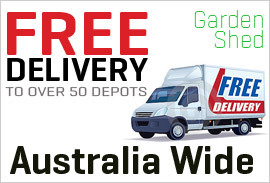 We offer 2 main forms of delivery; Home Delivery or Pickup from Depot (see Depot List here). Depot Delivery (Free): When your product arrives at the Depot, they will call you to let you know it is available for pickup. Home Delivery: Freight to CBD areas is normally a flat rate of $89 for most sheds. The home delivery option and pricing is visible in the checkout process and we do our best to offer the most competitive rates to your door. 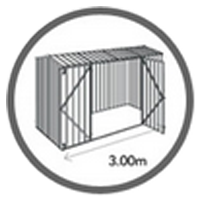 Larger sheds and greater distances from the CBD may attract higher costs but will be visible in checkout or we will quote you. Process: Most of our sheds are manufactured after placing order at our factories in Australia. This process normally takes 3-5 business days after which the 3rd party delivery company can pickup your order and deliver. The actual transport normally takes 7-10 business days. Although we do not run or own transport companies, we have extremely good success with their delivery. However, if there are any issues or faults with your products, we do whatever it takes to ensure you have the product you ordered in perfect condition. GardenShed.com.au is committed to protecting the security of your data. We use a variety of security technologies and procedures to help protect your personal information from unauthorised access, use or disclosure. For example, we store the personal information you provide in computer servers with limited access that are located in controlled facilities secured by the latest in surveillance and security technology and located in Australia. When we transmit sensitive information (such as a credit card numbers) over the internet, we protect it through the use of 128bit encryption, such as the Secure Socket Layer (SSL) protocol. If any goods arrive damaged, be sure to mark the delivery receipt as being damaged to avoid being liable for replacement costs. We request that you email photos of the damage as well as providing proof of purchase in the form of your receipt, invoice or order confirmation email. We can then process your replacement parts free of charge. Please ensure you notify us not later than 30 days after delivery. The Buyer acknowledges that the Goods require assembly by the Buyer on a “do it yourself basis” (“DIY”). The Buyer shall be responsible for thoroughly reading and understanding the instructions for assembly before commencing assembly of the Goods. The buyer will strictly comply with the assembly instructions and all safety guidelines. In the event that assembly instructions or safety guidelines are not contained with the Goods the Buyer will not commence assembly or use of the Goods until obtaining such instructions and guidelines from the Seller. The Seller shall not be liable for any damage, injury, or loss occasioned by the Buyer failing to comply with this clause or the assembly instructions and safety guidelines. We recommend you carefully review your order before adding them to your cart and proceeding with your order. We accepts returns for change of mind within 30 days of receipt of your items however, a refund of the product price, less a restocking fee of 30%, will be offered for any change of mind returns. Delivery costs are non-refundable and return freight costs are at the buyer’s expense. When the returned item has been received into our warehouse, your refund will be processed. If you need to return an item, simply send us an email with the details of your order and the refund request. We will notify you via e-mail of your refund once we have received and processed the returned item. This Service provides general information about GardenShed.com.au and the products and services they offer. The information contained in the Service has been prepared solely for the purpose of providing information about GardenShed.com.au, its subsidiaries and the services and products they offer. GardenShed.com.au reserves the right to change, delete or move any of the material on the Service at any time without notice. GardenShed.com.au and its affiliates shall not be liable to you or any third parties for any direct, indirect, special, consequential or punitive damages allegedly sustained arising out of your access to or inability to access the Service. This includes viruses alleged to have been obtained from the Service, your use of or reliance on the Service or any of the information or materials available on the Service, regardless of the type of claim or the nature of the cause of action.